What a lousy year for corn. Every ear is small and deformed. I consulted my husband’s aunt, who has plenty of experience with corn, and she concluded that this summer was just a lousy year for corn (among other things). With more than fifty days of rain, everything suffered. Just about everyone I talk to has a story to tell about short plants, worms, and low yeilds. It’s easy to commiserate over our small family plots, but what hurts the most is seeing farmers lose everything on account of one bad year. ← Who’s Got Time for Wheat? I am about to harvest my poor, pitiful field corn, too. Thanks for the encouragement, everyone. And Ginny, great suggestion with the cornmeal! Unfortunately all the stalks and ears got mixed in with the weeds destined for town recycling. A perfect reminder that there’s a use for everything. This was our first year trying corn and for some reason it was great! Not sure what variety it was, but we froze over 21 pounds off of the cob, not including all the ears we ate. We were so surprised. 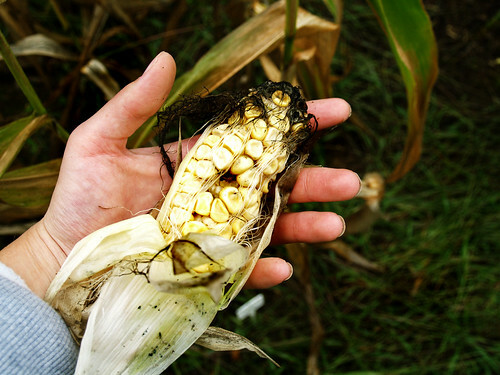 So sorry to hear your corn didn’t work well for you this year..